Vern Burkhardt (VB): Given what you learned in your research about venture capital- backed companies, if you were starting up a company would you seek financing from venture capitalists? If so, under what circumstances? Amar Bhidé: Only under the most exceptional circumstances. If I had a great personal reputation, if I had put together a great team, if I had proprietary technology, and if there was some compelling reason to raise a large amount of money, then I would consider it. But these conditions are rarely met. The percentage of companies that get venture capital funding from the get-go is a tiny proportion of all start-up companies. Even companies that eventually do get venture capital funding, such as Google, typically start with individual investors. It’s only after you have acquired customers, and there is a clear path to scale, that it even makes sense to think about venture capital funding. VB: And that’s because you need the extra capital in order to make it take off once your trend occurs. Amar Bhidé: Yes, but venture capital necessarily comes with a lot of strings. Some of these strings can make it more difficult for companies to improvise and change direction. So there are trade-offs. VB: Do you have any tips for entrepreneurs who wish to secure venture capital funding for their business idea? Amar Bhidé: I think the real question is does it make sense for you as an entrepreneur? Venture capital is a pretty good source of capital if you have everything lined up right. But if you don’t, it will take a miracle for you to get financing; therefore, it is not worth trying. VB: Are venture capitalists adept at trying to minimize their risk by waiting for what appears to be a successful trend? Amar Bhidé: Venture capitalists are not risk-avoiders. Rather, they accept specific kinds of risks and avoid others. They typically don’t take risks on nascent markets where there’s no evidence of whether the new category will attract customers or not. They don’t take risks on unproven management teams. They don't take risks on business models which do not have some kind of proprietary technology. That having been said, in spite of not taking these kinds of risks they still face a huge amount of risk. Many venture capital backed businesses in fact don’t do so well. VB: That’s also why they take a portfolio approach, so they can spread the risk. Amar Bhidé: Yes, but even with a portfolio approach there is risk. Banks also have a portfolio approach to loans, but it's different. Banks expect to lose money on a few bad loans, which they hope to make up on the rest of their portfolio. Venture capitalists expect mediocre returns or losses on most of their investments, which they hope to make up with a few big winners. VB: You point out that social skills are valuable in modern innovative activity, where teamwork between ever changing participants occurs. You also say that in interviews with a dozen university presidents and chancellors about how their institutions contributed to the dynamism of the economy, they cited the value of teaching students how to learn and helping them to develop confidence and social skills. In addition to a willingness to take risks, are these the keys to entrepreneurialism? Amar Bhidé: Absolutely, they're the keys to innovation, to technological progress, and to entrepreneurialism – but all these concepts are quite broad. I’d simply say they are key to a dynamic society, which includes entrepreneurialism and innovation. VB: The conclusion might be that colleges and universities are key to a dynamic society? Amar Bhidé: Good habits of the mind, confidence, and the ability to communicate and get along with other people is usually learned – or at least improved – at good universities. But it doesn’t necessarily have to be at a university; it could be at a community college or, in some cases, at good public and private schools. It still happens in the U.S., which has a good higher education system no matter how much people whine about students not learning enough math and science. VB: You say "economic models notoriously fail to predict booms, recessions, inflations, and accelerations and decelerations in productivity—not to mention significant changes in interest rates, exchange rates, and stock prices." Alan Greenspan, former chair of the U.S. Federal Reserve, was reported as saying that forecasting the economy is no better today than it was fifty years ago. Given today's difficult financial circumstances world-wide, does this mean the bailout packages and other policy initiatives put in place to stimulate the economy are based on little more than educated guesses about their effects? Amar Bhidé: I am very concerned about the bailouts. Whether they will work or not is extremely uncertain, whereas the potential for them to lead to corruption and misallocation of resources is very high. The example I like to use is the 1970s take-off of inflation. President Nixon's administration used it as an excuse to impose wage and price controls. Nixon said he didn’t really believe in wage and price controls but things were so dire that unless he did it the world would come to an end. Successive administrations muddled on like this for eight years – nothing good happened. It was Paul Volcker’s tight money policy which eventually got us out of the inflationary spiral. It took time, which was painful, but it was done in a principled, systematic, and transparent way. The current bailouts are being done in a haphazard, opaque way which has the potential to damage people’s confidence in the very financial and economic systems they are supposed to fix. VB: Especially if the bailouts don't have the intended results. It’s hard to predict the causes and effects, isn’t it? Amar Bhidé: Correct. On the one side the benefits are incredibly nebulous. But the costs are staring at you in the face. VB: It could lead to a lack of confidence in the political system, couldn’t it? Amar Bhidé: It has already generated a lot of cynicism. VB: You say it is nearly certain that the bailout will lead to corruption and misallocation of resources. Is this based on the lessons of history? Amar Bhidé: Yes. And look at what’s going on now. VB: You point out that China has increased its capacity to produce goods for international markets more quickly than it has increased its capacity to consume these types of goods, resulting in a savings glut channeled to the U.S. borrowers through a financial system with serious defects. What should be done to reform the financial system of our global economy? Amar Bhidé: People say you need global coordination mechanisms in a global economy. I say that’s all very fine in theory. But in practice, we can’t even stop piracy through international coordination. So what are the chances we are going to solve the financial crisis on a global basis? As a practical matter, this is best handled at a national level through better domestic regulation and oversight. And even at a national level, the regulatory system has to be administratively feasible. A simple remedy, which I’ve written up in articles in BusinessWeek and Economists’ Voice, is the old-fashioned idea of narrow banking. Regulate by way of law what anyone who takes deposits from the public can do. Nothing besides making loans – after old-fashioned due diligence – and simple hedging transactions. The standard would simply be whether the loan can be monitored by bankers and examiners who don't have PhDs in finance. Let everybody else do what they want, without any further regulation as long as they don't trade with, or borrow from, the core commercial banking system. The blowup of the Internet bubble is instructive. It was painful to those affected and wiped out one half a trillion dollars in equity, but it had no systemic consequences because it didn't seep into the banking system. VB: So developed countries agreeing to go into deficit to the tune of 2 or 3% of their GDP in order to stimulate the world economy may or may not be successful? 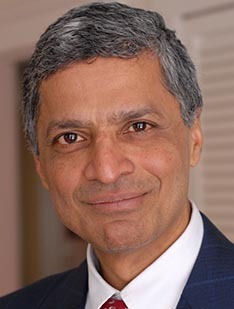 Amar Bhidé: I personally do not favor large fiscal stimulus packages. Governments should intervene when there's a clear and obvious ill that needs to be addressed. I'm skeptical of these preemptive strikes – whether they are against weapons of mass destruction or preventing depressions. This doesn’t mean ignoring economic distress. Of course we shouldn’t have people going hungry. We should have enough of a safety net to prevent the soup kitchens, soup lines, and shantytowns of the Depression. But this can be done with modest increases in transfer payments – it doesn’t require massive bailouts of the financial system or stimulus packages. Let us eliminate the suffering that is clear and obvious. VB: Is it possible that using bailouts and deficit spending to stimulate economies relates to the needs of politicians to appear to be doing something that will hopefully work? Amar Bhidé: Absolutely. But leadership doesn’t always involve taking dramatic actions. Leadership sometimes involves telling people that the path to a cure is a slow, painful path. Churchill didn’t promise overnight victory in the Second World War. VB: But what he did do was provide vision and encouragement. Amar Bhidé: Vision, enthusiasm and resolve. VB: Resolve was probably most important of all. Amar Bhidé: They didn’t panic. But our government has panicked. We've been told if we don’t throw seven hundred fifty billion dollars at the financial system the world was going to come to an end. The rot in the system was fifty years in the making. But we're saying we're going to fix it immediately, without debate, transparency or due process. VB: All through big bailouts. Amar Bhidé: It was one thing for Abraham Lincoln to suspend habeas corpus in the Civil War. But you don't suspend habeas corpus in every skirmish. Habeas corpus is an important part of our civil liberties as are the ideals of the free enterprise system. VB: What we’ve been talking about relates to your Chapter "First Do No Harm." Amar Bhidé: If you don’t know what is going to work, for goodness sake be careful to not screw things up – especially things that are, on average, working reasonably well. VB: In his 2006 State of the Union Speech former President George Bush announced the American Competitiveness Initiative aimed at helping the U.S. remain a world leader in science and technology. In 2006 the U.S. government also took measures to provide funding for scientific discovery and research in universities, and for an expansion of R&D credits. The European Council has set a goal of spending 3% of its GDP on research and development. What advice would you give President Obama regarding what, if any, initiatives he should launch related to the U.S.'s innovation stature in the world? Amar Bhidé: Innovation stature in the world is an inappropriate goal for the U.S. government to pursue. It’s like gold medals in the Olympics – it’s nice if we win the most, but should not be of concern to governments, especially when there are more pressing problems to deal with. Fix the educational system. Or fix the healthcare system. The dysfunctions of the healthcare system are an enormous drag on the economy. Fix the financial system. These are all important domestic problems where getting the right kind of intervention is important. VB: Are you optimistic that these problems will be fixed? Amar Bhidé: I see a close and dangerous parallel to what Bush did with Iraq. He said I know there are weapons of mass destruction, and I know that unless we attack Iraq we are putting ourselves at enormous risk. Now you in Congress can debate this but unless you come up with a favorable resolution in two days, you’re putting all of our lives at risk. This is no way to conduct open discussion. I hear similar rhetoric about the stimulus packages. VB: There has been media speculation that Congress, and perhaps President Barak Obama, is considering a policy of America-first protectionism. Is this an approach which is necessary in order to promote economic recovery, or are there instances where it would be appropriate? Amar Bhidé: I cannot imagine when America-first protectionism is appropriate. VB: You say you are a great fan of numerical analyses, but are wary of how regression analysis is used in social science—complex social phenomena can't be explained by simple linear equations. Would you describe the research methodology you used to gather data for The Venturesome Economy? Amar Bhidé: I didn’t set out to write this book. I set out to ask the simple question, how is globalization affecting venture capital-backed businesses? I interviewed one hundred and six CEOs and immersed myself in the data about these companies. Elizabeth Gordon, my research associate at the time, did an incredible job of collecting and creating dossiers on what these companies did. The theses of the book emerged through an accidental inductive process. VB: An accidental inductive process? Amar Bhidé: It was like a judicial inquiry, trying to piece a coherent narrative together from the evidence collected from my interviews and from others’ “expert testimonies”. VB: Are there any major conclusions or assumptions you would change in The Venturesome Economy as a result of what you are observing today with the global financial crisis and economic slowdown? Amar Bhidé: I might add something about the financial sector. VB: In fact that could be a whole book in itself, couldn’t it? Amar Bhidé: Yes, it certainly could be. VB: Do you have any favorite books about innovation, management, or economic theories you especially recommend? Amar Bhidé: For innovation three come immediately to mind – Frank Knight’s Risk, Uncertainty and Profit; Nathan Rosenberg’s Perspectives on Technology; and the third is Jon Elster’s Explaining Technical Change. Good Capitalism, Bad Capitalism by William Baumol, Robert Litan and Carl Schramm is a fine book published in 2007 about the system as a whole. I’m a great fan of Alfred Chandler – Scale and Scope: The Dynamics of Industrial Capitalism. Richard Nelson and Sidney Winter's An Evolutionary Theory of Economic Change is also very instructive. There are fifty to sixty books other books I think are terrific, and I directly reference them in The Venturesome Economy. VB: You said a bit earlier you didn’t set out to write this book, though you certainly write lots of papers and give presentations to scholarly, and sometimes to non-scholarly audiences. Can we anticipate another book, and, if so, what will be the topic? Amar Bhidé: My next ten-year project is a book on useful knowledge. To be more specific, what are the similarities and differences between engineering, medicine, business, law, and education on the one side and physics, chemistry, biology, and biochemistry on the other? I also have in mind a shorter-term project focusing on an idea I briefly touched on in my concluding chapter, which is that the optimal level of the state’s role in the economy increases with technological sophistication. Whether that will be a long article or a short book, I don’t know. VB: When will your book on useful knowledge be completed? Amar Bhidé: Ten years from now. VB: Ten years from now? Amar Bhidé: Yes, I’m quite serious. Amar Bhidé: A big project. I have no idea how it will turn out. VB: Is there anything I didn’t ask you? Amar Bhidé: God no! This is the most comprehensive interview that I’ve had to-date. VB: Thank you. You've been very generous with your time. Conclusion: The world is not flat, as author Thomas Friedman suggested in The World is Flat. It doesn't matter in which country high-level research takes place because its findings travel easily and at relatively low cost—such as the cost of licensing intellectual property. The application of high-level knowledge is generally applied at the local geographic level, and developed countries can afford to adopt these new technologies and know-how. The current financial crisis can't be fixed by government bailouts. Bailouts may help somewhat, even if only by giving the appearance of action. Perhaps we need to consider other points of view. First do no harm. I liked your interview with Mr Bhide. and am intrigued by his project on 'useful knowledge' and would like to know more about it and quite possibly share some ideas on the subject, and relate it to the handicap principle in theoretical biology.